Alex T on Do You Have The Courage To Dream? Health and Beauty Facts on Do You Have The Courage To Dream? Jesus grieved and wept over Jerusalem (Luke 13:34,35 and Luke 19:41,42) because he knew Jerusalem would be trampled down in 70 AD and an hour is yet to come when all nations will come against Jerusalem as prophesied by the prophet Zechariah. Yet the final outcome will be victorious for the Kingdom of God as King Jesus will rule from the Holy City and all who have survived of all the nations that came against Jerusalem will go up year after year to worship the King and celebrate the Feast of Booths (Zechariah 14:16). In the meantime, much has happened in Jerusalem and Israel over the last 150 years or so as we witness the return of the Jewish people to their ancestral home, the restoration of the Hebrew language, the blooming of the land, and most astounding the increase of Jewish people who believe that Jesus is the Messiah! Hallelujah! Jerusalem is the center of the nations (Ezekiel 5:5). Not Tehran, nor Mecca, nor Cairo, nor Washington DC, nor Moscow, nor Bejing, nor Tokyo, nor London, nor Paris, nor Rome, nor any other city. It’s Jerusalem! In this city our Lord Jesus was crucified, died, resurrected and ascended back to heaven. To this city our Lord Jesus will return as his feet will stand on the Mount of Olives. There is no city like it! It is unique! Man has tried and continues to try to bring “peace” to this city, but it is beyond us! 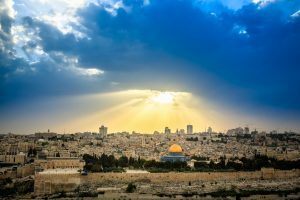 The Bible instructs us to “pray for the peace of Jerusalem” (Psalm 122:6), but what does that really mean and how do we effectively do it? The meaning of Jerusalem is “teaching of peace”. Jeru means Torah or teaching. Salem means peace. The word “pray” in this Psalm means to “ask” so the phrase can be written to say “Ask about the prince of peace and his teaching of peace.” Therefore, when we pray for the “peace of Jerusalem” we aren’t praying for the absence of war per se although we can pray that the enemy of our souls not be allowed to bring war out of God’s timing. We should be praying that people (souls) that do not know Jesus as Messiah begin to ask about him and his teachings. We can also pray that those of us who do know him have a deeper understanding of his teachings and walk as disciples in this world. May we be salt and light and draw others to him. We can pray that veil in front of the eyes of the Jewish people becomes thinner and thinner and that they will look up and recognize Yeshua (Jesus) as Messiah and that a spirit of supplication and repentance comes upon them so they will cry “Blessed is he who comes in the name of the Lord!” (Luke 13:35). Only when this happens on a national level will the Lord return. Let us cry out for a great harvest of souls in Israel and throughout the Middle East of both Jew and Gentile. In Hebrew the word “peace” means completenes, wholeness, a state when things are as God intends them to be so this is what we are asking of God. We are not asking Him to withhold the final time of war because as it is written, so it will surely come. Jesus prayed that we would understand the way of peace. May we understand it and pray for others to understand it also. That is “praying for the peace of Jersualem”. Will you join me in it? 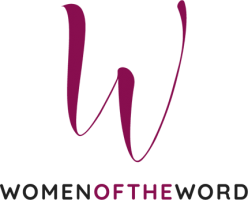 Betsy Roy is the Director of Women of the Word, an inter-generational ministry dedicated to helping women grow as disciples of Jesus by applying God’s Word through the power of the Holy Spirit. WOW holds conferences, retreats, Bible seminars and trips to Israel. Betsy and her husband Jim lead the trips to Israel, which include visiting with local believers, both Messianic and Arab. Together they have 3 daughters and 3 grandchildren which are the delight of their hearts. God’s mercy endures from generation to generation.